The project integrates intelligent part reconstruction using the second generation of the Robot Operating System (ROS2) framework to improve 3-D image perception when robots autonomously sand and finish parts. See a demonstration at SwRI's Booth No. 8214 at Automate in Chicago April 8-11. 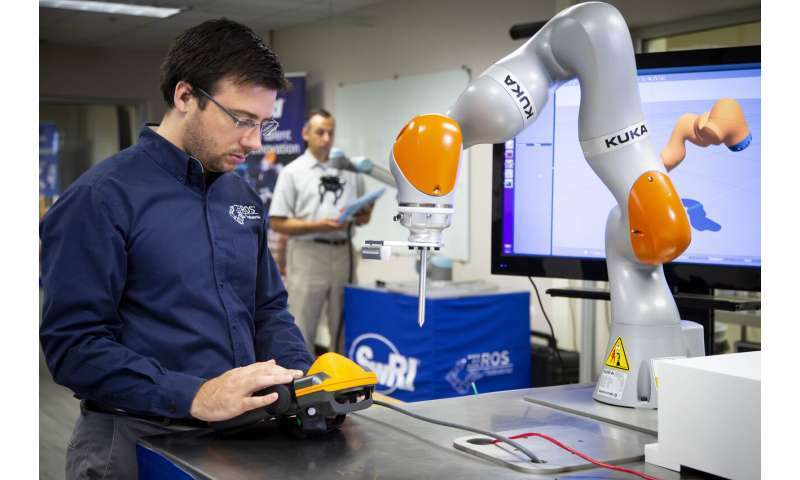 "This is a great case study in the benefits and challenges of integrating ROS2 into industrial robotics," said Matt Robinson, an SwRI manager who supports ROS-Industrial. "It also shows how advanced perception algorithms can enable faster, more reliable scanning of metallic objects." The latest ROS-I solution uses ROS2 to integrate cameras affixed to a robotic arm, collecting point cloud data at a high frame-rate to create a 3-D output mesh that optimizes path planning. Machine vision cameras and algorithms have historically struggled to render accurate 3-D images of metallic objects due to the "visual noise" that scatters off highly reflective surfaces. This significant challenge limits automation of welding and surface finishing processes in aerospace and automotive manufacturing. SwRI, in collaboration with ROS-Industrial, overcomes this challenge by integrating truncated sign distance field algorithms that stitch together several images, or point clouds, at a higher rate. The solution uses TrajOpt, or trajectory optimization for motion planning, within the ROS-Industrial Scan-N-Plan framework, to enable real-time trajectory planning from 3-D scan data. "This project was ultimately a successful bridge from ROS to ROS2," Robinson said. "But we know it's going to be a big task to move toward ROS2 as so many dependent packages and capabilities are still in ROS." The ROS-Industrial consortia —with branches in the Americas, Europe, and now Asia—provide cost-shared applied research and development for advanced factory automation. Consortia members drive new capabilities in ROS-I by championing focused technical projects based on their near-term automation requirements.